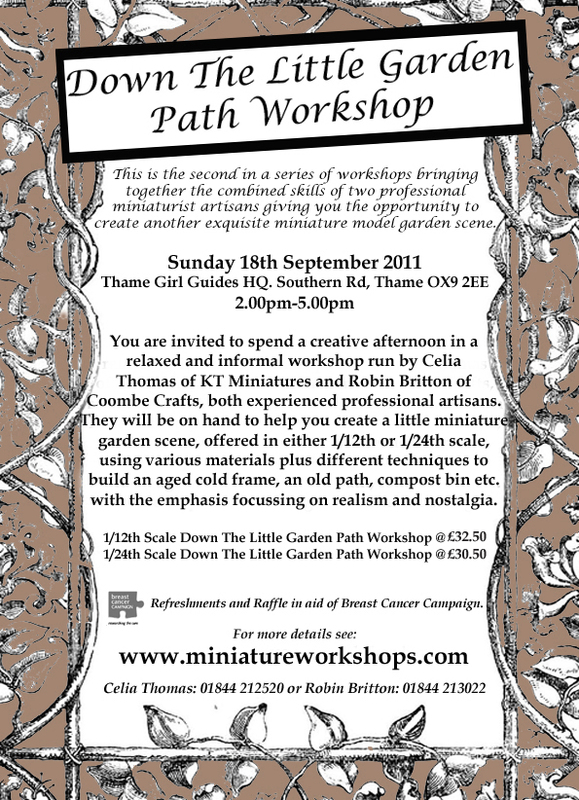 Our first OVER THE LITTLE GARDEN FENCE WORKSHOP is now imminent....this Sunday....and all is prepared. We are trying to anticipate any hitches....but there is a limit. Bit of a fluster a couple of days ago when signs started to appear around Thame that main roads were going to be closed on Sunday....aaagh!! And I could not work out how people were going to be able to get to the venue!! However, a quick dash up to the Town Hall revealed that there was no need to panic..it was only going to be for an hour early on Sunday morning due to some huge road race where 1,000 people will be running round Thame.....so that's ok then! Phew. Below are some photos of items that will be on the Display Table on Sunday, to give people an illustration of the type of atmosphere/look we will be endeavouring to create in future workshops. Most will be available to purchase on the day and have been made by both of us. This is taking place on Sunday 18th September. If anyone is interested, you will be able to download a booking form off the website or failing that, just get in touch with either of us (contact details on website) and we can reserve a place for you whilst the booking form is sent to you. BOTH ROBIN AND CELIA LOOK FORWARD TO SEEING ALL OF YOU WHO ARE BOOKED TO COME TO THE WORKSHOP...ON SUNDAY!